I’ve never traveled outside of Canada or America before, so this was an exciting first for me. Our original trip plan was to have a relaxing beach getaway, but I successfully managed to turn it into a mini road trip adventure. We stayed in a small hotel in the surfer village of Jaco, a 1.5 hour drive from the airport. We chose to rent a car and drive down to Jaco, as appose to renting a taxi or shuttle bus to get to our hotel. Neither my fiancé nor I surf, so having a car allowed us to venture around town and explore. Road trip tip: outside of San Jose, there are no street signs or street lights. This makes it challenging to know where you are going. We printed off directions from Google Maps, but still had a hard time navigating our way down to Jaco. Once you get on Route 27, you will pass through three roundabouts (with no signs). You’ll want to turn right at the third roundabout onto route 34. Use the mile markers along the side of the road to know how far until your next upcoming turn. It’s also good to know that there are three toll booths you’ll pass through, each costing about $1 USD. After sleeping off our jetlag, we drove a half hour north to Tarcoles for a crocodile boat tour. This was a lot of fun, and I highly recommend doing this. 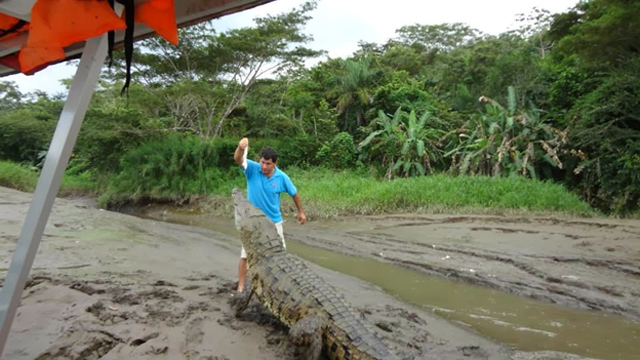 One of the guides actually gets out of the boat and hand feeds chicken to a crocodile! Needless to say, our guides were a lot of fun. The following day we paid one of the guides to take us around parts of Costa Rica and act as our tour guide for the day. Best thing we’ve ever done. It was great to experience authentic Costa Rica, and meet locals outside of the tourist spots. Our guide, Franklin, took us down to Manuel Antonio National Park to go look for monkeys and sloths. The best part about having him with us was we were able to sneak around the back of the park, and walk through a less touristy area where the monkeys generally hide out. His friend owned the restaurant that backs onto the park, and they let us on to their property for the day. Franklin had such a great eye for spotting toucans, sloths, and different species of monkeys. 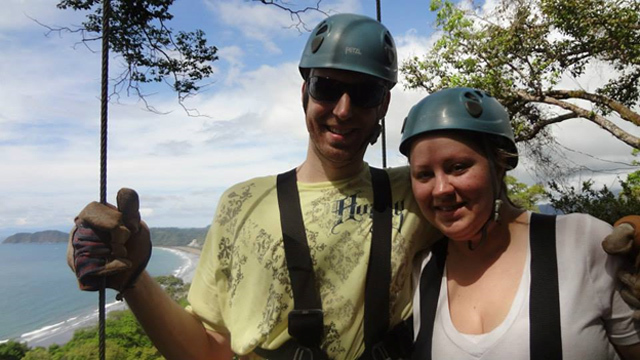 We had such a great time down in Manuel Antonio National Park, we hired Franklin for another day tour. Road trip tip: Costa Rica is all about adventure travel, but many of the travel packages from tour providers can be quite costly. Hiring a private guide and renting a car is really convenient, and can save you quite a bit of money. A few days into our trip Franklin took us on a taste and smell tour of Costa Rica. We started off on a local farm in Carara, where we were introduced to different foods grown on a local farm. It was interesting to see green oranges and yellow limes. We then moved on from the farm to explore the Costa Rican rain forest looking for moneys. We got such a great tour of the small villages in the rain forest. Franklin even introduced us to some of his friends in the area, and we were able to talk to them about their food, culture, and economy. Really nice people. We ended a very long day in Quepos, just north of Manuel Antonio National Park. 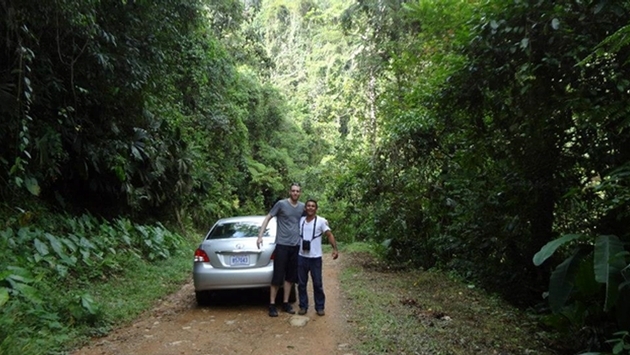 Our little Toyota Yaris held up quite well on the rough 4x4 back roads of the Costa Rican rain forest. After spending several days exploring parts of the pacific side of Costa Rica, we had some much needed down time on the beach. We also ventured down to Playa Harmosa for ziplining, and rented a quad for some off-roading fun up in Fila Negra (northeast of Jaco). While driving through the remote villages between Carara and Quepos we saw a highway sign for Las Vegas. We were told that the town was named after the U.S. town of Las Vegas because the women were the most beautiful women in all of Costa Rica, so they named the town after Las Vegas, Nevada. We booked one hotel for our entire trip and figured we would move around the pacific side with our rental car. If we were to go back to Costa Rica, we`d probably only stay in Jaco for a few days, then book a hotel up near the Arenal Volcano as that`s where a lot of tourist attractions (like spelunking) and day hikes are. 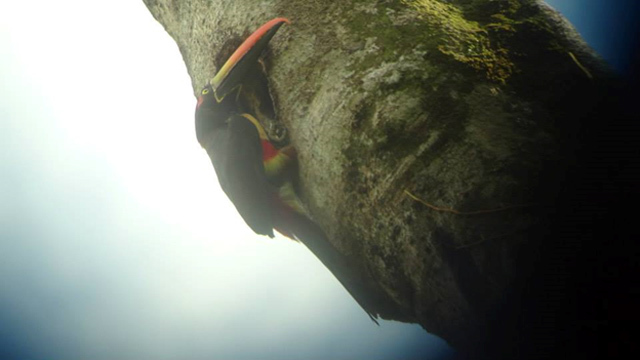 It’s a seven-hour drive round trip to the Arenal Volcano and back to Jaco. I would also have loved to explore the Caribbean side of Costa Rica, down by Limon, but we just didn`t have enough time.